In 1996, a behemoth of a novel got published called Infinite Jest. I remember picking it up at my local bookstore and glancing through it – more than 1,000 pages, with 388 endnotes and a highly elusive plot. In short, the type of long and challenging read that at one point in my life I may have regarded as interesting, but that now I would probably categorize as pretentious. I didn’t buy it, but in the months after I was keenly aware that author David Foster Wallace was being regarded as a literary genius. And while I still have not read the novel, I know enough from reading about Wallace that the man was probably just that: A highly intelligent thinker and complicated human being whose outlet was the written word. Then the other day a friend sent me a video that a small production company had made, without permission, from parts of a commencement speech Foster Wallace had given at Kenyon College in 2005. The speech was called This is Water: Some Thoughts, Delivered on a Significant Occasion, about Living a Compassionate Life. The video went viral, and while it is good enough, what struck me – hit me to the bone, really – was listening to Wallace’s voice. The truth behind those words, and the honesty with which Wallace enunciated them, made me cry… at work, hiding behind my desk, hoping my boss wouldn’t wander by and think I was really grateful for my job. Immediately after I decided to watch The End of the Tour, the 2015 film that looks at Wallace’s life during the book tour that accompanied the publication of Infinite Jest. I already had it in my sights for a future watch, but hearing the speech precipitated my curiosity. 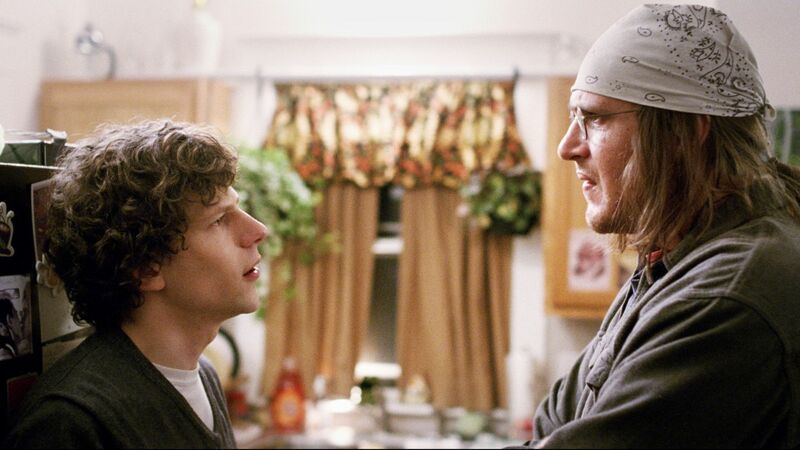 Interestingly, the film is really not so much about Wallace (played by Jason Segel), but about David Lipsky (played by Jesse Eisenberg), the Rolling Stone writer who interviewed him for an article just as Infinite Jest was becoming a success. In fact, it is mainly about Lipsky’s idolization of Wallace, and his knowledge that, as a writer, he would never get to the level of brilliance and recognition Wallace himself – ironically – somewhat rejected. This is very rich territory to explore, and I was more than excited by it. However, it requires an intense level of acting, both verbal and physical, to match the intellectual sparring between two real-life characters who spend most of the film in cars, hotels, and planes simply… talking. The good news? Segel, someone I would’ve never associated with this type of performance, literally becomes Wallace… or at least his interpretation of who Wallace was. He breathes painful humanity into the author’s every word, cadence, and body movement, his mind always looking for some sort of explanation on what it means to be alive. It is a vulnerable, tender, nuanced turn, and I am frankly surprised Segel was not nominated for an Academy Award (nah, scratch that, I am not surprised). On the other hand, Eisenberg plays Lipsky as a Woody Allen-ish nervous motormouth: Antsy, insecure, slightly arrogant. The problem is, isn’t that how Eisenberg plays everything? From Adventureland (2009) to The Social Network (2010) and Now You See Me (2013), isn’t this the same guy? To me, his one-note performance is a big issue, for in order to get into Lipsky’s head – into the mind of a man torn between admiration and jealousy – you really need to sense the different levels of emotion playing within. And sorry, Eisenberg just isn’t a strong enough actor to pull it off. 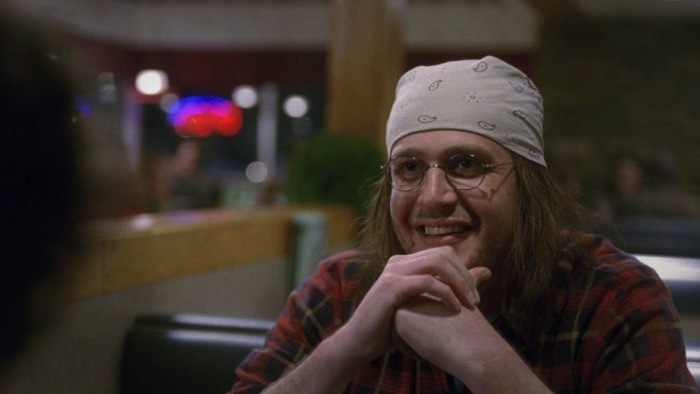 The End of the Tour has other issues – the bookending technique highlighting Lipsky’s memories of Wallace felt clichéd to me, and the meandering tone does not seem to fit well with the academic fireworks. But still, the film made me even more interested in Wallace, who took his own life in 2008 after dealing with depression for many years. The knowledge of his death paints The End of the Tour with a heartache that is beautifully captured in Segel’s interpretation. If anything, he is the reason to watch.